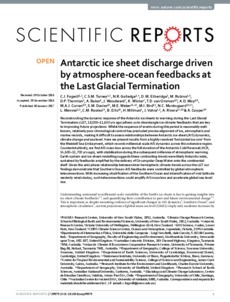 Reconstructing the dynamic response of the Antarctic ice sheets to warming during the Last Glacial Termination (LGT; 18,000–11,650 yrs ago) allows us to disentangle ice-climate feedbacks that are key to improving future projections. Whilst the sequence of events during this period is reasonably well-known, relatively poor chronological control has precluded precise alignment of ice, atmospheric and marine records, making it difficult to assess relationships between Antarctic ice-sheet (AIS) dynamics, climate change and sea level. Here we present results from a highly-resolved ‘horizontal ice core’ from the Weddell Sea Embayment, which records millennial-scale AIS dynamics across this extensive region. Counterintuitively, we find AIS mass-loss across the full duration of the Antarctic Cold Reversal (ACR; 14,600–12,700 yrs ago), with stabilisation during the subsequent millennia of atmospheric warming. Earth-system and ice-sheet modelling suggests these contrasting trends were likely Antarctic-wide, sustained by feedbacks amplified by the delivery of Circumpolar Deep Water onto the continental shelf. Given the anti-phase relationship between inter-hemispheric climate trends across the LGT our findings demonstrate that Southern Ocean-AIS feedbacks were controlled by global atmospheric teleconnections. With increasing stratification of the Southern Ocean and intensification of mid-latitude westerly winds today, such teleconnections could amplify AIS mass loss and accelerate global sea-level rise.